Can be used to replace the USI-1208, USI-1213 and SS-790 alarms (uses same bracket & connector plug). 5 Year Limited Warranty on Alarm. The USI Electric USI-1204 Hardwired Ionization Smoke and Fire Alarm responds quickly to fast-flaming fires to protect your family against deadly threats in the home. Perfect for new or replacement installations, the 120-volt AC hardwired alarm is suitable for houses, apartments and mobile homes. This alarm features a convenient silencer button to temporarily quiet a non-hazardous alarm and Smart Interconnect to connect up to 18 units. The 9-volt battery (included) provides continuous protection in the event of a power outage. Ideal for replacement of existing smoke alarms, this detector features a large mounting plate for coverage of drywall impressions or old paint marks. The red LED light flashes when smoke is detected and the green LED light indicates that the power is functioning. Full dust and contaminant covers protect the device from spray applications, so you will not need to remove the alarm during any construction procedures. 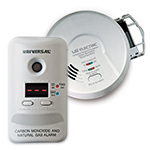 This smoke and fire alarm is UL Listed, California State Fire Marshal approved and Federal Housing Authority (FHA) approved to exceed industry standards. For maximum protection, install a smoke and fire alarm inside every bedroom, outside every sleeping area and on all levels of the dwelling. The USI Electric USI-1204 Hardwired Ionization Smoke and Fire Alarm comes with a 5 year limited warranty. USI Electric is a subsidiary of Universal Security Instruments Inc., a U.S. based manufacturer of high quality, easy-to-install home safety products. Founded in 1969, Universal Security Instruments has over 40 years of heritage in providing home safety products for families. With state-of-the-art manufacturing facilities, Universal Security Instruments continues to launch revolutionary new products and technologies with the mission of always working to keep families protected. Product Dimensions (W x H x D): 5.31 x 5.31 x 2.00 in. Great e-commerce site, easy ordering, timely delivery. Got it all correct the first time. Was very happy to find the same model smoke/fire alarm that were originally installed... additionally, purchasing directly from USI saved me lots of money compared to buying them through amazon! 100% satisfied! Perfect replacement for my existing ones that were expired. Plug and play for ease! Direct replacement for smoke detectors that were installed when my house was built. No need to replace the brackets or plugs. Very satisfied that the 8 smoke detectors were the correct replacement for the ones I had. It was easy to remove the old ones and simply replace the new ones without retiring. Bought 4 of these because they will mount into the old universal ss-790 I had installed previously. Fit perfectly into the mount and power connector. They arrived on time and all work nicely. They will chirp a few times after installation and testing, but that will stop shortly. Easy to order online. I followed up with a phone call question, after order. Lady on phone was very helpful. I installed the new smoke alarms. Installation was very easy as all I had to do was plug in the new alarm to the already hardwired base. Excellent product! Thanks for making installation of new smoke alarms very easy! I purchased 11 USI-1204HAs to replace USI1204s from 2004. I had no problem installing the units. I kept the original ceiling mounts. After cleaning the mounts with a damp rag, the color match to the new units were very close. I expected much more discoloration in the mounts after 15 years. I tested the units and they functioned as expected. Called for info on smoke detectors and found out there is an expiration date. Who knew! Ordered replacements that came promptly and at a good price. Very satisfied. The product was easy to install and has a warranty of 5 years. It is working perfectly. The price was very reasonable and delivery was efficient. I will order from USI again. Arrived in time, easy to install and it has great battery backup system. Displays red color when battery back up is working. Purchased these to replace seven old units for a cousin. We didn't have to re-wire, as we were able to use the old collars. The new units fit perfectly. I needed a couple of units to replace two that were damaged. They are an exact fit. They will be easy to install and put into operation. I have the Universal Security smoke and fire alarms in my house and love them, I had one that had issues and so I replaced it with this one and all is well! great product! After our smoke alarms expired I called your company and was able to get new alarms to install. I was able to get replacements that plugged in to the same base. Saved me time and money. Thank you for the peace of mind for keeping us safe. Replacements were needed, I reviewed similar devices and selected this product. Excellent replacement and easy to install. I am pleased with my purchase, it was exactly what I was looking for and would recommend people to this company's website. Great price. Fast shipping. Thanks!!! Learned, when replacing my detectors, that units had 10 year life. Advised president of our H.O.A. 514 condos built in 2004 that most, if not all, detectors should be replaced. Residents were to be notified. Perfect replacement. As a retired electrician, I offered to replace detectors for a friend. Learned that units had 10 yr. life, so replaced mine as well. Had to call Customer Service to order the proper replacement and they couldn't have been nicer. I had the order in three days and they work wonderfully! Thank You. Super easy to replace your original units. Plug and play. I recommend these units to all my neighbors. Thanks for having these available!! This model is exact to the replacement I needed. My home is 15 years old and these are hard to come by unless you want to replace the entire alarm mount and all. So happy to stop that chirping. The smoke alarm I ordered was the correct part and works perfectly. I am very happy with the item I ordered. Builder installed 17 years ago, just now replacing. Great Quality and easy to install. Was able to unplug old one with a broken battery door and plug in new one-- no problem! All my smoke alarms had to be replaced they were expired by 5 years. Happy with my purchase. These new smoke detectors were perfect. These are great for a quick replacement of your existing units. Fast shipping. I've told all of my neighbors about this easy replacement. No Re-wiring!! Can't get better than that!! Nice to know that this original item installed when my house was built is STILL available. Easy to install. Customer service was able to verify exactly what I needed to replace my old detectors. I was able to place the order & received it so fast. I replaced all my detectors in minutes with no rewiring. Thank you! I have been using Universal Security Instruments 120-Volt wired in USI 1204HA smoke detectors for years and always have been very pleased with the quality and reliability along with the long lifespan. Had to replace 7 smoke detectors in our home that were older than ten years and I searched for these. They arrived in a timely matter and installing them was a breeze! I ordered four of these smoke alarms to replace the ones installed in my house. The product was delivered on time and in good shape. Installation was easy. Ordered replacement for 14 year old detectors. Replacements were exactly as ordered, great price and shipped and received in excellent time. Could not be more pleased. Replacement for an older model. I was very satisfied with the product. It was an exact fit. Everything went as stated by your sales agent. Good service. I found the ordering process and the advice given for the correct smoke alarms to be top notch. I had ordered 30 replacement detectors for myself and 5 of my condo neighbors. Received them promptly and at an excellent price. I was able to replace all of the units in a short time because they were a direct replacement. I will be introducing Universal Security at the next Homeowners meeting. Thanks for your help. Exactly what I needed. Order was complete and shipped quickly. After ordering alarms online and they were not what I needed I contacted Universal Security and got the correct smoke alarms. Our house has seven interconnected model 1204 smoke detectors the 1204HA is a direct replacement. All were due for replacement due to age, the 1204HA is perfect, I did not need to change the base. Just remove old detector from the old base and plug in the new detector to the original, already installed base, pull the battery tab, and twist new detector on to the old installed base. PERFECT! Actually easier than changing the battery! Great solution! Outstanding service and product. Thank you. Very happy with my purchase, product was exactly as described and easy to operate and install, only negative was shipping which took forever. We apologize for the delay in shipping, Winston. We've just sent an inquiry about the delay to our shipping dpt. They work well and were super easy to install. I also added carbon monoxide detectors to my house. I contacted customer service to inquire on comparable units since all of mine are on same circuit. They were very prompt and helpful with their reply. Great product at a great price. Good seller, fast shipping. All of the service was handled in a very professional manner. My alarms were 13 years old and started beeping off an on. Replaced all batteries each year during Thanksgiving. Discovered that these have a useful life of 10 years. Removed one of the 6 alarms looked up the company and found the replacement. Arrived when they said they would. It took me 15 minutes to replace 6 alarms using the original base, that's including moving an 8 foot ladder. Perfect replacements. Thank you so much for shipping our order in a timely fashion... I can not say enough about the lady that took our order. She was wonderful and I wish more people were as nice as she was on the phone. Please thank her for her professional manor and for being so very pleasant. Everything went well with this project. The seven hard-wired smoke detectors arrived quickly and were able to plug in to the original bases. All seven units worked properly. I was finished quickly with replacing my 12-1/2 year old smokes. Happy happy! I replaced older units that were 15 years old with the same units and it saved me a lot of time not have to rewire the base to the electrical. I just plugged the new into the old wiring and it worked fine. This unit also seems to be improved over the previous version. As a side note the green light also is a bit brighter and serves now as a night light. Best prices around and the item was exactly how it was advertised. Had to replace 4 units-all installed easily and are providing me with a sense of security! Replaced 5 units, had been putting off replacing, as I thought I would have to replace whole unit. Was happy to find USI store as these units fit installed bracket and replacement was a snap! In cooperation with our local Fire Department, residents of our retirement community were advised to replace all of the smoke detectors in our homes. This model was recommended as exact replacements for the ones used by the original builder. Swap-out was fast and easy, and I can again be confident in my homes smile alarm system. I needed to replace my 15 year old 1208 model smoke alarms, and was very happy to find the 1204HA model easily replaced them. They fit into the old base, and no re-wiring was needed! Many thanks to Michele in support who pointed me in the right direction when I inquired about replacing them. Although it is my mistake that I didn't get what I thought I was ordering, still a little miffed. Didn't need complete system only needed sensing part. We're sorry you weren't completely satisfied with your purchase. We'd be happy to provide assistance in any way possible. Replacements were an exact fit for my original units that had expired. Ordering was easy and friendly, great service. Direct replacement for the USI-1208 120 V AC/DC Wired Alarms currently installed. Replaced all 6 Detectors in a matter of minutes. No re-wiring required. I replaced 4 detectors installed in our new condo in 2008. Units were at the limit of life expectancy. Installation was simple and took about 3 minutes each. All work well and look like original. Reviewed: 12/22/2018 by E. N.
With the help of Nicole R. I found out the exact new model number that replaced our existing old fire & smoke alarms. Also Michelle M. emailed the explanation as to why fire & smoke alarms need to be replaced every 10 yrs. Ours where like 15 yrs old and started randomly beeping even with fresh batteries. Good lesson learned!! Never knew we needed to do more than just check battery! We sleep better knowing all 8 smoke & fire alarms are replaced and have new batteries. Green light is on. Thank you for your customer service via email and phone. It was the right alarm, wasn't sure it would be my condo is 13 years old. Went everywhere looking for one. Very happy it was the right smoke alarm. Would order again from this company. The detectors were a reasonable price, and were very easy to install. I was way overdue for new detectors. These detectors fit right into the existing brackets and wire connectors where I had some 2002 manufactured USI-1204s. Now i have 2018 USI-1204HAs and I'm good for 10 years. Good feedback on order status. Would buy from them again. Delighted customer. Great price. Very easy to install to replace old units base. I had to replace my existing Smoke and Fire alarm since they were over 10 years old law is need to been newer than ten years. What was great is that I did not have to remove the base no rewiring necessary. I simply unscrewed the alarm and re-crewed in the new one. Perfect fit. Took me only an hour to do so for 8 units and would have been much less if some of them were not on 15 foot ceilings. Very pleased. Easy to order and arrived quickly. Also a great price these sell on amazon for $30 dollars and as I ordered 8 this was quite a saving. I am very pleased! Just replaced old smoke detectors. These are exactly the same. They work great. Smoke alarm came on time and worked like a charm. Easy swap! Great customer service! Easily replaced existing USI detectors with these. Customer service was excellent! They were friendly, helpful and they shipped within an hour of me placing the order! Needed six this time and price was significantly cheaper than the same ones I previously purchased from Amazon. Wish I'd seen these back when I purchased the others! I ordered 8 smoke detectors for our home to replace out of date wired units. They were promptly shipped and all were fresh from the same 6/18 production batch. All installed in the existing mounts without problems. Easy replacement for an older product. Easy order, free shipping, prompt response. I've had USI in my home for 13 years and it was time for an upgrade. I purchased new sensors from USI direct and the swap was simple. Now my home is safe for a least another 13 years. Home update using USI 1204HA Universal Security Instruments Ionization 120-V AC/DC wired Smoke and Fire Alarm with Battery Backup was a snap to install and the home now has new replacement alarms. They are easy to test, look good and ready to detect smoke/fire. They have long life and highly recommended for home safety. I bought this to replace another USI-1204 smoke detector that was working well past its expected end of life date. The new one was easy to install in the existing bracket and I'm sure I'll get many years out of this one, too. I ordered replacements for my entire home. They were easy to install and work well. In addition, the products arrived as ordered. I would recommend this product and company without hesitation. We bought our home 2 years ago, it was built in 2005, so 13 years old. Our smoke detector began incessantly beeping at odd hours no matter how many new batteries we put in. Buying the replacement was cheaper here than on Amazon & it arrived within a week. Fit perfectly and no more beeping. We'll be back when others need replacing. Easy to plug in and replace same model. I wanted a replacement that was the same size model to fit the existing mount. Most other wired-in choices are larger, so finding the same model made this very simple. When I found out the smoke alarms hard wired into our house were a discontinued model I worried about having to rewire, but the ped Universal recommended as replacements just piped right into the old mounts and worked right. Easy peasy. It was easy to install. Support was a great help when I called to ask questions before my purchase. Easy to install. Shipping was great. Product was on backorder, but came in on time. Easy to install. I had a very good interaction with customer service, Jenna, at http://universalsecuritystore.com/. I needed a replacement for the discontinued USI-1208 to fit in the same existing hardwired bracket. This did the trick!!! I appreciate customer service taking the guesswork out of the replacement product I needed to order. Fast shipping. Easy to install. Works with existing USI smoke detectors. I ordered two smoke alarms to replace two of mine that had gone bad. All I had to do was unscrew them from the base plug them in and screw them into my bases. I couldn't ask for anything easier and the shipping was fairly fast. Very easy to replace and easy to test. I was pleased you still had the unit we needed for our 16 year old home. Replacing old 1208 model no new alarms have the 3 prong plug connection. This one did so could plug into old plug and easily attached to old base on wall. Beats having to remove old base and rewire the connection plugs. Perfect replacement for my model 1208 units. Best price I could find online. I ordered 7 of these to replace my old 1208 smoke detectors, easy replacement. My house is 10 years old and the smoke detectors are at the end of their life cycle. USI was quick to show me which unit would put my system back in service, and I had the part in a day or so. Good job! Product arrived ahead of schedule. Product was as described and was a direct replacement for old USI 1208. The alarms look great, communication was good and the delivery was fast, thanks! I ordered 6 smoke detectors to replace the old ones in our home, service online was very good, very quick in getting the order shipped, I will use again if needed. Purchased these to replace my 10-year-old alarms. They were very easy to switch and work great. They were shipped on time and delivered in good condition. Reviewed: 08/27/2018 by Holly M.
We have a series of these alarms in our home. I love that when one is triggered they all go off. It means if a fire starts at the other end of the house while we're sleeping, we'll still be alerted by the alarm in our bedroom. I realized that I needed to replace 5 detectors due to expiration date didn't know about detectors expiring. Detectors arrived and the swap was easy. I had to replace the mounting plates on 2 of them as the small mounting tabs broke. Used existing wire nuts and presto! easy install! Items are a perfect replacement. Great value and fast shipping. Plug and play for faulty smoke detectors. Perfect replacement for builder installed units. Took only a couple of minutes per unit to change out. Only complaint was the units were out of stock when ordered and took a few weeks to receive. It worked. We replaced all detectors in our home by matching the model number. I was concerned the connectors would not be the same, but they all installed in 5 seconds! This smoke detector is one of the best in the market. The original one worked for 8 years without any issues. This is the only place I can find the exact detector/alarm I need to fit in the brackets in the ceiling. Great price too. The product works great! The only problem was the boxes were a bit crushed from shipping. I would suggest you use a stronger shipping container. The detectors work perfectly! 5 stars out of 5! We purchased these units to replace out-dated versions of the same model. Installation was a snap, literally. Snapped right into the previously mounted housing. Replaced 7 detectors in less than 10 minutes. Bought this to replace previous units that were too old. Very easy to install. Just unplug the old one and plug in the new. If you need to replace the housing, it's all included and it's not complicated either. Replacement heads for 14 year old alarms. Fitted perfectly with minimal installation effort. Completely satisfied. I had 8 older versions of this smoke detector in a house we were rehabbing. Manny of the battery boxes were broken and the units were 13 years old - time to change them out. Universal helped me by suggesting a new model that i could just plug and play using the old mounts. Worked perfectly. Used 7 of the model 1204 HAs to replace old USI model 1208s. These easily attached to the old model 1208 bases. No need to put new base units in. Was able to replace all my alarms very quickly. Just had to unplug the hold and replace with the new and they were ready to go! I ordered some replacement alarms. I had a couple per-purchase questions, and had quick and accurate responses from customer service. Need the exact model installed by the home contractor and it was still available. Order arrived quickly. Items are actually cheaper here than at other online stores. Highly recommend. Fast shipping. Great turn around and beat price on the internet! I needed to replace some older USI smoke detectors past their expiration date and ordered the USI 1204HAs because the mounting bracket was the same. Installation could not have been easier! Unplug the old unit,plug in the new and lock in to the existing mount. I had to replace one mounting bracket and the install was also quick and easy! We received a quick reply to our smoke and fire alarm question. Then we received our order for the product in a very timely manner. Thanks for the good service. The date on our smoke alarms were outdated and needed replaced. Universal had the same model and replacement was easy. Advertised to be direct replacement for 1208, and it was. Good job. Thank you. Worked perfectly and will be ordering more. Happy that a battery was included. Product was exactly as advertised, a direct replacement for my obsolete 1208. If there was one thing I could find any fault with, it would be that the RED LED is so dim and overpowered by the green, that I thought that it was not working because I could not see it, even at night, but I was able to determine that it was indeed working. USI's website is user friendly. I breezed through my recent smoke detectors purchase. Love it! Shipment arrived as forecast except for 1 day weather delay. Units were easy replacement for old units and worked great. 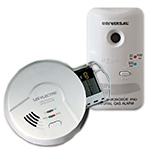 We already had USI smoke detectors 120 V with 9v back up battery. I unhooked the old one, connected to the new one and was done. Reviewed: 04/20/2018 by Jeffrey D.
Installation is easy and straight forward. The customer service representatives from Universal Security Instruments have been helpful and even sent me a link to a video on how to install the new style alarm I purchased. It helped the process go much faster and everything is working well. I'll definitely be purchasing from their website directly from now on instead of through other online store fronts. Ordered these to replace 13 year old builder installed units. I simply used the main units that easily slipped into the exiting hard-wired base. Had the whole project finished in less than 30 minutes, including ladder set up and take down. Very pleased. I bought the battery only unit to put me over the free shipping amount and will put it in the garage. Our old smoke alarms needed to be replaced. I emailed the store and they gave me the right model to order. They installed without a problem. I did the first two, my 13 year old grandson did the rest. Quick and easy. I replaced my old smoke alarm with this model without having to remove the wall mount. This fit perfectly even though it was slightly different. Website easy to use, receipts & shipping information timely & accurate. Product ships within 1 day of placing order. Products received in good condition and are exactly as ordered. I really liked this model was an easy replacement for an older model. Just twist out the old, unplug, activate the battery, plug and twist the main part in. The base is the same. It was very easy to place my order online. My order was shipped in a timely manner, and was packaged securely so it would not be damaged. I was very pleased. These were perfect replacements for the 15 year old original equipment. Unplug old, plug in new, twist into place. 5 more to go. Great compatibility with my existing system. Items ordered were delivered promptly, and they were easy to self-install. Fast service, excellent packaging at a reasonable price. The alarms I ordered were exactly as represented, arrived ahead of time, and were very easy to self-install. In addition, the Customer Service Dept. was extremely helpful in making sure I was ordering the correct product. Was easy to install. Am going to get another one, exactly the same. It was great to be able to find these smoke detectors to replace the ones already installed in our house. They fit perfectly in the base already installed on our ceiling. The order shipped quickly and arrived in good condition. No Complaints! Thanks for good service! HAPPY with alarming satisfied with the speed of delivery. Thank you. THE ADVICE RECEIVED, THE PRODUCT, PRICE & DELIVERY WAS THE BEST THAT I COULD EXPECT. THANK YOU. Great and easy to install! We have had our fire alarms for 10 years so the latch broke on one when the battery needed to be replaced. This was closest to exact one and it was perfect and easy to install. This was a replacement for the 7 that I had to replace because the old ones said that it need to be replaced every 10 years. Easy to install, use same brackets and each one came with 9 V battery. Very happy with the product. Fast delivery at a good price. The smoke and fire detector was a replacement for my existing alarm. I used the existing base as I didn't want to mess with the wiring and the new unit works great. Thanks. Easy to install. Exactly what we ordered. Shipped/arrived as scheduled. Fantastic customer service representative - professional & knowledgeable. This product is the exact replacement we needed. Appreciate your assistance with the order. Was looking for a form, fit & function replacement for smoke/fire detectors installed by builder in 2001. USI-Electric staff was very helpful & got me what I needed in short order. Product arrived within & week & worked perfectly. Am a very happy camper. Easy installation to replace my existing smoke alarms. Was able to use the same bracket and connector. This was a replacement and very easy to install. Exactly what I asked for and to my surprise included batteries! Ease of insulation & customer service was great. We ordered replacement detectors for ourselves and 40 of our neighbors. They were compatible with our current bases which made them easy to install. Everyone is very pleased. Thank you to Jenna and Nicole in the customer Service department for all their help. The service was very prompt and able to set up in a short time. Replaced one unit after 13 years and the replacement is functioning fine. Glad to find the replacement part so easily. Replaced out of date units with ease. Units arrived quickly. My old alarms were 11 years old and started going off for no reason. I am not married to someone I trust to put in a new mount. I contacted the company and they let me know which ones would be perfect to work and to fit the mount we had in place. They work perfectly. Very easy process and great customer service. Needed to replace my household smoke alarms, as they had reached the 10 year life. USI provided the new smoke alarms quickly and at less cost than retailers. Thanks for helping to protect my family! Needed these to replace my out of date units. They fit the old base exactly saving me labor and time. They are a good buy and and are U.L. Listed. When I realized our smoke alarms were out of date, I simply ordered replacements from the company website. Our delivery was on time and I was able to install the new alarms with no trouble. Happy client!! Quick service!! Product was perfect! Thank you!! I had to replace 4 smoke detectors from 2006 that were hardwired and networked. I couldn't figure out what the replacement was so that I didn't have to rewire/reinstall a new type -- just plug in the new ones. I called customer service and they were very helpful model # had changed slightly. I ordered direct since I couldn't find them locally. Shipment was on schedule -- very pleased! Thank you! Received the order promptly, even though I was told product was on back order. Very satisfied with this purchase. Item was back ordered but no big deal. Easy plug in replacement, and comes with batteries. Less expensive than buying at the local hardware stores. Integrated into hardware of prior version nicely. Direct replacement for a USI-1208a. Plugged right in and up and running in minutes. Replaced 3 older models that were 13 years old and started to chirp. Extremely happy with this purchase. Purchased these as a replacement for 16 year old smoke detectors and were a perfect, simple drop in replacement. No need to rewire the bases! An easy snap in replacement. Service and delivery was very good! I went shopping at Home Depot and Lowe's for replacement to my current smoke alarms with no luck at all. They gave me the runaround and were not helpful whatsoever. I decided to log into the Internet and look up your company directly. I was very pleased with the service and with the quick delivery of my units. I had a lot of questions on how to install them and Michele was extremely helpful in the process. I recommended your company to several neighbors and friends as well. Where do we dispose of the old smoke alarms? Fast service and a great replacement product. Easy to install. Found this item on-line to match 6 other alarms with same brand and model. Easy to install and happy to match the existing units. Excellent service products delivered on time and in perfect condition. I was able to remove the old one and just place this one in the same hub as the old one and this was perfect for a DIY job. They fit the original holders and booted right up. Great product! After we lost power during Hurricane Irma, our smoke detectors started going off. Once power was restored, I attempted to reset them. It was at this point that I discovered they were all 15 yrs old. So glad able to replace with the same model. Saved me a lot of time and we're all safe & sound again! These were easy to install and we haven't had any go off on their own! Great Product! Easy to order and fantastic shipping along with a breeze to install. Home Security at its best. As it turned out I did not need a new unit after all. I just reset the one I had and all is well for now. Keeping new unit for future use. The fire and smoke alarm came undamaged. It was the exact one I ordered. It was easy to install and works perfectly. excellent service and product. Fast service!! It was very easy to replace the old Smoke Detector with this model replacement. Two screws and three wires. Works Well. My home had the USI-1204 previously installed when built, after discovering they work in sequence together I couldn't find the original in stock. I called USI and was informed that the USI-1204HA will work as a perfect replacement. USI has great service representation, fast shipping and a reliable product! Mine were expired so changed all 5. Smoke detector portion installed into old bases so it was a quick and easy job. Only complaint is the old bases are more of a beige color and the new ones are an off white. All in all not a big deal. Who looks at your smoke detectors anyway? Replaced all smoke detectors in my house, wanted same ones we had before for easy installation. Great experience, nice price just wish shipping would have been quicker. Would like to be able to recycle old detectors if possible. This ionization detector was selected for compatibility with existing mounting plate for expired 10 year old Alarm USI-1208. I used my own 10-year lithium battery in place of the alkaline battery provided. If you have a compatible mounting plate already installed, this alarm is a simple and inexpensive plug and play replacement. We needed to replace a smoke detector in our home and we were able to locate the exact same model from Universal Security Instruments, Inc. Very satisfied with the purchase and would recommend this company to anyone. Thanks Universal. Customer Service was very helpful in directing me toward the new model that replaced the detectors I currently have. I like that it is hardwired and battery back-up. Ideally, I would have liked it to be an ionization alarm and a photoelectric alarm. The new unit worked fine. I'll be ordering more in the future. It is the exact detector we have in our house and all I had to do was plug it in. My product came in very quickly & worked great! These fit the old 1208 model bases and is a 10 second replacement... not sure why the originals died but at least the fix was easy. As soon as the items arrived we installed them. We needed to replace two detectors that were no longer functional. Once installed, they worked great! We've not had any problems since. I would recommend these items to be purchased. My old universal units were 12 years old and expired but I was able to find the same model as the old ones and put 5 of them in my house. Now I am good for another 10 years or so and feel secure and safe. Ordering was easy, less expensive, better units than in stores and free delivery. Can't beat that!!!! Easy to install, plus instructions were easy to follow. I was glad to find that these units are available to replace the original units that were installed in our house when it was built. Easy to install. Easy to install. I have had same smoke detectors before works great. Great product...easy to install! Good value for the price. Replacement for previously wired-in smoke/fire alarms. We changed all the smoke alarms in our condo and decided to get exactly the same we had. Customer service was great in helping me find out which model was the one we needed. We installed them with no problem and with that ease we got just what we needed. The package arrived in one box without any physical damage. All 10 units worked properly without any issues. My home is 10 years old and the smoke detectors fit and looked perfect. Great smoke & fire alarm. I'm rating this product five star, very easy replaced and on time shipping! I am extremely pleased with the product I ordered. I simply had to plug the new alarm into my existing base. I am also extremely pleased with the customer service I received. They knew exactly what I needed to order to replace my alarms. The price was excellent too! I replaced my old USI fire alarms with USI 1204 HA and they work perfectly. Hopefully, these will work and last as long as my previous ones, some 8-9 years. Needed to replace our older/outdated models with the 1204 model. They showed up promptly and were easy to install. Everyone I spoke with at the company was courteous and professional-- Thanks folks! Well be replacing the rest of them in our home with these, as well. Thank you for the quick response to my order. I received the alarms and installed them. Just wish they weren't so sensitive. Although they don't go off like my old one. Enough said, you're speed is great as well as your prices. Again thanks. Direct replacement for what we had! After watching a Today Show segment about smoke alarms and testing them, we tested with a smoking candle/incense all our hard-wired alarms. Two didn't work and we found that all of them had expiration dates stamped on them indicating they should have been replaced 4 years ago. These replacements plugged right into the pigtails and clipped right on the existed mounting plates. The items worked great and were a great replacement for the USI-1208. They even fit into the existing 1208 wall mounts. Good company and a good product. Excellent product, great service, delivered as scheduled. I've replaced my existing smoke alarms after several failed after 15 years of service. the model I had had been discontinued, but a quick email exchange led me to the correct replacement. the order was filled much faster than I could have imagined and I will continue to do business with this company whenever the need arises. We had USI-1208 smoke detectors and after 10 years they needed to be replaced. We replaced them with the USI-1204, and it was simple. No bracket replacement was necessary. And they work great. I would recommend these if you're replacing the USI-1208. I ordered 6 replacement alarms for my home. They were promptly delivered and were a perfect match for the older ones I had. The face fit perfectly over the old base and no rewiring was needed. Batteries were included, too! All 6 replaced and working in a very short time and with little effort. 1204HA plugged in and worked. Very easy! I plan to order carbon monoxide detectors from you now. Instructions were clear Installed on existing bases. I purchased these as replacement for original equipment. Was so nice to replace old ones of these with new ones and not have to deal with the wiring, even though i know it's easy. Just didn't feel like doing it 9 times. Good ol 1204s haven't changed much over the years because they are very reliable. A quick connect cable so that the mounting bracket could be re-used would be an improvement. My smoke detectors were 10 years old and had to be replaced. I ordered 5 exact plug in replacement units at a great price and shipped hours after ordering. Great customer service. Told my neighbor and he ordered also and was amazed at the price and fast shipping, rare service in this day and age. Items arrived quickly and packaging protected contents Alarms were exactly as advertised. I will order again from this site. We had older alarms in the home that was wired and also with battery back up, they all are replaced now with updated models. The USI web lets you know the correct model # to use if the older one is outdated and also lets you know that each one talks to each other one installed. I have replaced several of the smoke detectors in my rental home and they work fine. These were replacement for 10 year old units. direct plug and play took less than a minute to swap out with existing units. Remember Smoke detectors are only good for 10 years. This model replaced an older model that was in the house and making noise. Replaced one floor, then the other floor started making noise. Easy enough. They were a perfect replacement detector since mine were 10 years old and the NFPA recommends replacement at 10 years. Replacement fits well on the existing one. Product was delivered within two days, was exactly as described, was an easy replacement of 13 year old original detectors. Product quality is very good. Sure beats the big box stores offerings. Perfect replacement for the 2005 model. Plugs right into the existing housing. These were replacement smoke detectors. The originals were also USI and worked great. I returned the ones I bought at Lowes because they were already 4 years old when I opened the package. Buying direct is better. I received my order and was satisfied with the product. Easy to install. Easy to order and quick delivery. This was a replacement for 10 year old detector. It is exactly like the one I'm replacing which made installation very easy. This is the second detector I have purchased from Universal and each was a positive transaction. This was exactly what I needed, fast shipping. In fact I am going to order two more to update the entire system. Thanks for the great service. I needed to replace my detectors as they were first installed in 2002. I called the store and the lady knew what she was talking about and gave me the correct part number to order as a direct replacement. Everything worked as advertised so I am a happy camper. These units were easy to install, minimal effort. I'm very happy with the purchase. Excellent customer service. Item arrived early. Prices were great, and a pleasure doing business with Universal. We replaced our older version to this updated version..Works! Tried 3 orders. Finally, this was the right alarm. Excellent! They were exactly what I needed to replace the old ones. Fire codes require hard wire items and ours had expired. The new alarms fit the old base just fine and we had no trouble getting them installed. Unplug the old ones and plug in the new ones! Your fire alarm products are true quality that I have used for years. Thank you. I was very happy to find a replacement fire alarm. The order came as described and was easy to install. Thank you! Very good quality, they last a long time. These were installed by the builder & truly lasted 10 yrs before they started to malfunction/false alarms. Items shipped within 24 hrs and were exactly what I wanted. I was able to replace 10 year old model 1204 fire alarms with the exact replacement . I didn't need to change the pigtail. The job was very easy. I am thankful that USI continues to supply exact replacements. Very good service. Delivered with NO problems. Very pleased with my purchase. These units were a direct replacement for my 10 yr old units, so installation was very easy. Thanks for helping me obtain the proper equipment to easily change out my aging house fire detectors. These fit the bases already installed in the house 13 years ago for a SD no longer made. Quick delivery, easy installation and included batteries. Very Satisfied. Perfect transaction. Great price, great service, product received when promised. 5 stars. Thanks. Very satisfied. All units are working well. They were super easy to install..
Works well...the right part i needed. I was very pleased with my order. It came in good condition quickly. I installed them without any problem. They are working perfectly. Product easy to install and works perfectly. I had 7 of these in my house, one of them went bad. I found these and they worked as promised. It synched up well with my older outdated USI 1208 model detectors in the house. product arrived as promised and as advertised. They were easily installed and tested as operable. Received. Installed. All good. Thank you! Ordered this product to replace a defective detector in my house. Because this was the exact same model that was installed when my home was built I didn't need to change and rewrite the ceil mounting plate, just unplugged the old unit and installed the new one in literally two minutes. I will definitely be ordering replacements for the rest of the house since all the units are now over ten years old. I just connected it and it worked, doesn't get any easier than that. Had them before. Works great. These were replacements. We need three more. Thank you! This was a replacement for the same model smoke detector put into my house when it was first built in 2002. What was nice is the base plate and wiring harness was the same, so the replacement only took me 2 minutes to install. Item as described. Works great. Delivered on time. Was looking for a smoke alarm to replace the ones in my current house. This fit the bill exactly. Just had to take off the old one and screw on the new one. Did not have to mess with the housing at all. My smoke detector went out and the local hardware store had models that required re-wiring. USI had the original model at a decent price. Ordered it, got it, plugged the connector in, worked. No rewiring required, even used the same base it just popped in. My husband said this was easy to install. Highly recommend this product. It was shipped and received in less than a week. Our old one died and needed to be replaced. Easy online purchase, put in a new battery and swapped it out. Simple. My old Smoke alarm is the same model as what I ordered were 14 years old, felt it was time to replace them. So, I ordered the same unit. Didn't have to do any re-wiring, just snapped in the new unit, everything work fine. Works great fit right into old socket. Item was exactly as I ordered and delivered in a timely manner. the whole process was very good. These units were replacements for identical units that had been in service for over 11 years.I normally change detectors every 10 years. Only comment is that I wish the green power light wasn't so bright. It was simple to replace my out of date units with these new units. The smoke/fire alarm was a perfect fit to replace my old fire alarm. No rewiring necessary. Perfect in my opinion. OUR HOME HAS SEVEN USI SMOKE AND FIRE ALARMS WHICH WE HAVE NO COMPLAINTS. MY CONTACTS WITH THE REP FROM USI WAS VERY INFORMATIVE AND EXPEDITED MY ORDER. I WOULD RECOMMEND USI TO ANYONE SHOPPING FOR A DEPENDABLE UNIT FOR PROTECTION. I ordered this to replace one in my house that went bad. I had the older model and this one plugs right into the existing power and mounting hardware. It takes you longer to get the ladder setup then it does to actually install the new unit. The manual was easy to follow and install onto the ceiling. Glad I found the correct one. The product was exactly what I needed to replace my 10 year old alarms. Service was good, price was fair and the transaction went well. Easy to order on website. Fast shipping. Items were purchased to replace same model that was damaged. It was a perfect match and easy to install. Will be replacing all existing Alarms due to age in the near future and will purchase from USI. This product has worked perfectly. In fact, as if on cue, the alarms went off when the ten year replacement was due. Not a fun experience to unplug then all to have quiet, but a great indicator that they all worked after ten years! Replaced original alarms with same type. Original alarms lasted approximately 4 years beyond suggested replacement date. I highly recommend these alarms. Perfect replacement for our 10-year units that came with the house. Didn't need to replace the bases, the detectors snap right in. Item was an exact fit for a 10 year old device that had gone bad. We have these detectors all throughout the house and this is the 1st one go bad. The replacement was simple to install as it snapped right in to the old mount. Bought to replace 10yr old detectors. These were identical and fit perfect just like the original. Great detectors never had problem. Reasonably priced, well packed and delivered on time. Installation was a snap as we were just replacing with the same type of units. It is an excellent product and my customer love it. Worked like a charm didn't need to change anything on my old connection basically pulled battery tab and pulled it in and screwed it to the mount. I needed to purchase replacement wired detectors that had gone out of date but wanted to replace with the same so no wiring or mounting plates would require changes. The customer service department answered my question by the next day and they were ordered. They were received and installed without problems. Thanks! The order process was simple and shipping was quick and product was a perfect match to my old base. Just snap connector and twist. Couldn't have been easier. Thank you. Everything worked well. They fit perfectly in older frames. I will look on your website for all our security needs in the future. Everything arrived intact and was installed without issue. Thank you. I hope you will not change future models so I can reuse my existing connection plug instead having to install a new base. I ordered these to replace my old ones. The new smoke alarms work great and fit the ceiling mounting for the old units perfectly. Customer service was great. Item received as described. Very easy to install, just remove my old one, and mount on these new ones. Glad I found you guys. Shipping was quick. Will buy from you again. Thank you. I was amazed that I could save money by ordering these alarms online and have them shipped rather than buying at a store. I did save and was able to not have to remove the old base that was attached to the ceiling which saved time. Cheaper than COSTCO. These were a nice upgrade to what we had before. The install was easy. Smoke Alarm replacement made simple! The unit comes complete with wiring, battery and the base unit! All you have to do is turn your power off, unhook old unit and replace with complete new unit. Made Simple! easy to replace head when time expires. This smoke detector is extremely reliable and lives up to its reputation of being a smart smoke detector. So glad we chose wisely and completely trust Universal Security! This replaced a defective one that existed in our house. The wiring connector fit perfectly into the existing base that already existed on wall. Excellent product! Thank You, USI. The product was what I needed and the price was excellent. I had a question and the representative was terrific. Purchased replacement smoke detectors and they arrived overnight and were plug and play. Minimal effort on my part. It was very easy to just replace the old systems with the new ones, there was no new wiring required. I'm very grateful these were still available online. I was surprised to find out smoke detectors expire. USI had a direct plugin replacement helping me avoid a rewire! I highly recommend this company and the customer service exceeded my expectations. Our house is wired with 11 of these detectors and we have never had any issues. The battery backup is an excellent feature. Easy to replace existing smoke alarms. Received correct items on time and work perfectly when installed. As advertised,the 1204 unit and wiring snapped right into my old 1208 base plate. Easy is good. Very satisfied. Would buy again. I researched on Amazon and bought on USI store because they had the best price. Also, I read about someone that had to get a replacement but all mine six worked right out of the box. Just installed today. The shipments went to a neighbors blame Fedex on that one. Ordering process was easy and so was installation. I found the comparison charts very useful. I suggest staying with the version you already have installed in your home so you don't have to strip wires. Excellent smoke alarms. They where replacements for the existing ones that where in the house. I replaced 10 smoke alarms that were 9 years old with exact same model with no problem. Easy to order, prices were good, product was what it was supposed to be, and delivery was pretty fast. I would definitely order again from them! I called USI to see which product was a direct replacement for the hard wired USI products that were previously installed in our home and these were recommended. They fit perfectly and I was able to replace all of them myself. I was also pleasantly surprised when I realized that the 9 volt battery was included! Good customer service and it arrived quickly! I keep these on hand because usually my alarms go bad in the middle of the night and start beeping. These are a quick replacement and last a long time. I was looking to replace one of our Fire Alarms which was 13 years old and wanted the same alarm and we found it on your site, so we were very pleased not only with the product, but also the very good service. They went in easy and are working well. Have used this particular alarm for several years and it performs as advertised. It is a good value and the order process and shipping was excellent. It is easy to install and the battery replacement is very simple. Would highly recommend this product and the online store. The smoke detector replaced an old smoke detector in the house. It was the perfect fit in the old wiring without difficulty. The merchandise arrived quickly less than a week very please with my purchase. Promises made, promises kept! Very simple to replace. Just pull connector apart and hook up new part. Bought six of these items to replace existing alarm system. Highly recommend to anyone. Bought 4 of these units to replace existing usi smoke detectors that had expired. It was as easy as unplugging the old and plugging in the new. Very satisfied. My home was built in 2004. During the recent time change, I was inspecting the batteries and saw the expiration date stamped into the detectors. After a bit of research and confirming with our fire protection company @ work, I realized I need to replace my 7 smoke detectors which were now almost 12 years old. The USI model in my home, tied into my alarm system and fire sprinklers were easily available on the USI website as a direct replacement the originals. I emailed the company about bulk pricing and although my count of 7 didn't meet bulk pricing they offered me a 15% discount. The shipping was ground and took about a week but all arrived in great condition. I replaced both the detectors and the base as the color on some had yellowed due to exposure to sunlight. Overall am very pleased with the product, website purchasing and customer service. Way to go USI! Great solution for wired in whole house alarm systems as replacement or original fire alarms easy to install and great battery life! These fit perfectly on the existing mounts our builder installed in our house in 2002. We replaced 3 units which had expired by merely snapping the plastic wire clip into the existing wired wall mount. Easy and safe, working perfectly. Great replacement for older model USI. Hit the mark. Product support department also very good. Walked me through proper installation of the alarms. Thank you! We had great customer service and when we called to question why product had not arrived, we were assured that when it became available it was on back order we would receive it. We did and now have a safe home again. Thanks for all your help!!!!! My second time ordering. I can distinguish between the older alarms and the new by the subtle light that radiates from the new alarm. Very pleased so far. They are excellent and easy to put up. I was able to find the exact smoke alarms that were installed in our house 2002, and that simplified replacing them. The website was easy to use, and Universal Security Instruments had the best price for the same product on other websites. These were replacements for our existing smoke alarms that were 12 years old. The changing from the old to the new was very easy. I'd buy this product again for our next house. Great replacement product to my previous alarms. These were very easy to install as well! Very happy! 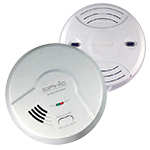 The USI-1204 smoke & fire detector has proven to be a very reliable & trouble free detector. I have several throughout the house. Each & every one of my detectors has lasted over 5 years before requiring either a simple battery or detector replacement. I bought these smoke detectors to replace some that were about 15 years old. They were hardwired without battery back up and these new ones are also hard wired but do have battery back up and they just plugged right into the original plug. I didn't have to do any wiring. I have 8 of these detectors in my home. The existing 11 years old units had started to fail. Easy install Snapped right into place without issue and it comes with a 9V heavy duty battery.The new units fit in the base of the existing unit, so I didn't have to replace the bases. Purchased 4 of these units replacing older unit and will be purchasing a couple more. A lot cheaper than on Amazon. Website was straightforward to order, very easy. Shipping was fast. Received product and it was as described. Will order again in the future. Bought it to add to existing system. I ordered 6 new smoke alarms. When I spoke to the customer service rep with questions about my order, she was very knowledgeable about the product I wanted to order. My order came at the time I expected it and was well packaged and just what I ordered. I would use this site again to place similar orders. Next up....Carbon monoxide alarm. Great service! Arrived sooner than estimated. Exactly as described and pictured. Speedy delivery. Bought as a replacement to one we had in our house. Works great. Received what i ordered in good condition. Completely satisfied. I installed replacement smoke detectors, due to the fact that my old ones were about ten years old. I needed assistance from this company by phone as I was having some difficulties. The person on the phone helped me solve the problem and install the alarms properly. The instructions were clear, easy to follow and installed with minimum effort. Excellent product. I believe it worked perfectly fine. The products are good quality. I bought 7 of these to replace existing alarms in my home that was built in 2006. The manufacturer recommends changing these out every 10 years but I decided to get ahead of the game a bit after 9 years. The performance on these models has been great and I expect the same 9-10 years of work out of the new ones I just installed. Incidentally, I only needed the inner parts as the outer shell was already wired and connected from the first USI-1204HA alarms that were wired in with the house. The coloring on the outer shell has not faded over the last 9 years and the new inner parts fit beautifully and matched in color too. Very satisfied! Very pleased with service and delivery! The house we bought was built in 2004 and had these alarms throughout the house. It was great to find the same one so I didn't have to do any wiring. The customer service was great. Purchased 4 of the USI-1204HA models, which replaced USI-1208 models that I accidentally broke and 1 that stopped working. I did not need the base and had no problems. I have used this brand of fire alarm in the past and purchased 5 replacement alarms after installing the initial one about 7 years ago. It was nice to be able to install just the replacement and not have to re-install all the mounting brackets as well. The model number was on back order at the time I placed the order but I still received the order within a ten day period. Great replacement for my 1209 smoke alarm. The cord and the mounting bracket fit like a glove.